ClearLynx has partnered with Amercian Express and PayClearly to offer supply chain finance that accelerate payments to suppliers and extends payment windows for buyers. Payment integration inside the ClearLynx bunker inquiry management platform allows buyers of bunkers to benefit from balance sheet neutral financing and many other procurement related enhancements in operations, compliance and reporting. Our partners offer Extended Terms and provide our marine clients competitive rates for working capital. Extended terms offsets rising interest rates and bunker fuel costs giving you more buying power. Pay suppliers quicker and earn early-pay discounts while maintaining float. Flexible payment platform caters to the marine industry. With new technology and Worldwide Acceptance, our finance solutions give you more accuracy, speed and cost savings to better serve you and your suppliers, resulting in Smarter Payments, Better Cash Management and Greater Profit Margins. ClearLynx Finance Solutions coupled with Extended Payment Terms results in Smarter Payments, Better Cash Management and Greater Profit Margins. Much like a Corporate Card account, ClearLynx Finance Partners issue a revolving facility for payments. You can use it to take advantage of early payment discounts from suppliers as well as increase your float through extended payment terms. ClearLynx technology helps you manage bunker data flow. ClearLynx has worked with Commercial Operations software companies to integrate our platform into their applications. Using our web-based APIs, it is easy to push and pull information from both systems. The simple integration process give you the commercial features you want in your application while not having to sacrifice the bunker features you need in ClearLynx. 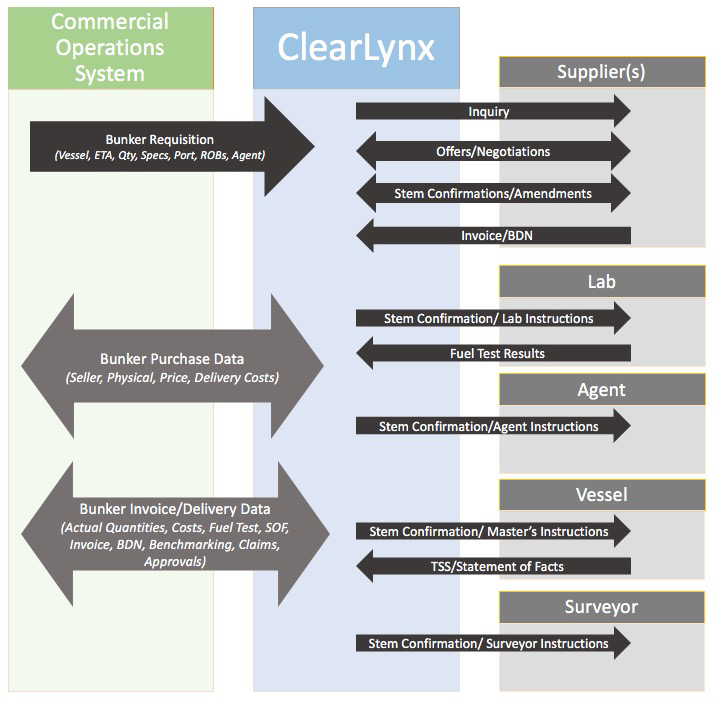 Initially, key bunker requisition data comes into ClearLynx from their systems. ClearLynx users then perform the necessary tasks of procuring the fuel and those results are store in ClearLynx. Both bunker stem and bunker invoice data can be transferred into and out of ClearLynx, saving you the time while ensuring accuracy. Additionally, ClearLynx approval roles can be mapped to client ERP systems and exchange approval data as well.